The word “Arab” most probable originated in Mesopotamia to describe nomads, West, and/or wandering people. No archeological, linguistic, or any logical evidences were found to prove that Abraham was really born and lived in Mesopotamia. 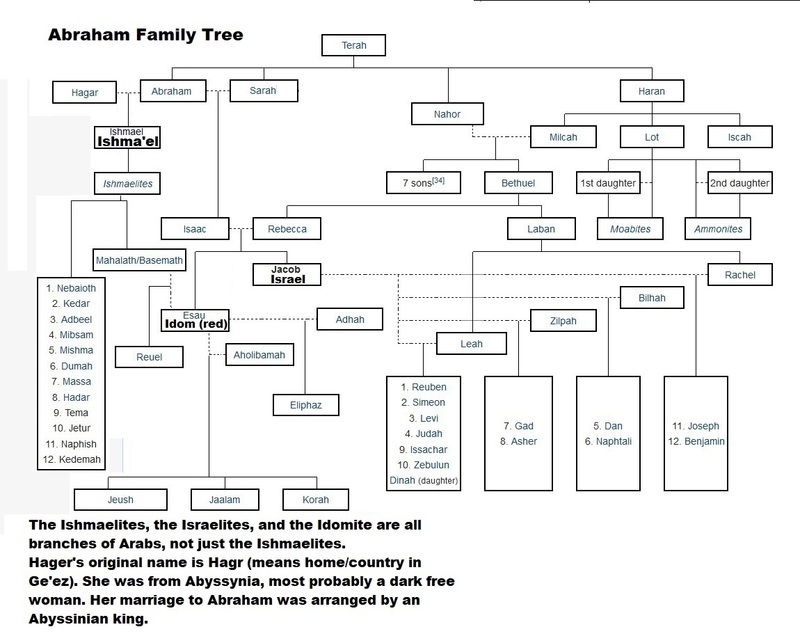 It is more likely that Abraham and his two sons Ishmael and Isaac were all Arabs and they lived in Yemen. Therefore, the sons of Jacob (Israel), son of Issac, who are the Israelites are Arabs too. The Ishmaelites, the Israelites, and the Idomite are all branches of Arabs, not just the Ishmaelites only. Hager’s original name was “Hagr” (means home/country in Ge’ez). She was from Abyssinia, most probably a dark free woman. Her marriage to Abraham was arranged by an Abyssinian king and could be his daughter. The Abyssinian king admired the faith and character of Abraham and asked him to marry an Abyssinian woman so as to have children and relate to him. Notice at that time there were no camels or horses (they were not yet brought or domesticated). Single hump camels were brought by Ethiopians from East Africa later. People in Arabia and Levant only used donkeys if they could afford it, and their movements were very limited and avoid desert. They could not travel too far in short time as the Biblical tales say. Therefore, Abraham entering Egypt on a camel is clearly a false tale. The geography of the Hebrew Bible describes Yemen, Asir region, Abyssinia, and Western Arabia only. There are no resemblance or evidences of Abraham and Israelite in Mesopotamia or Egypt at all.